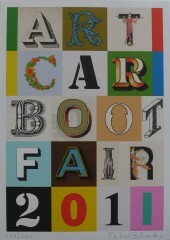 Peter Blake- Original Prints-Art Books-Free Delivery. 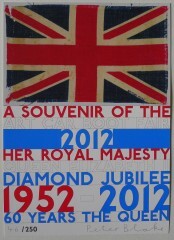 Peter Blake, painter and printmaker of urban realist subjects and a pioneer of ‘Pop Art’. 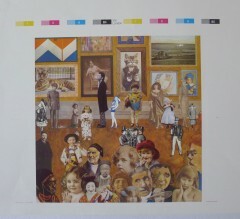 Peter Blake was born in 1932, Dartford, Kent and studied at Gravesend Art School 1948–51. He served his National Service in the Royal Air Force in 1951–3 and continued his studies at the Royal College of Art in 1953–6 where he won a First Class diploma. A Leverhulme Research Award enabled him to study popular art and travel in Europe in 1956–7. On his return he taught at St.Martins, Harrow and Walthamstow Schools of Art in the early 1960’s and began teaching at the Royal College of Art from 1964-1976. It was during the mid 1960’s that he was commissioned to design record covers & posters. The Beatles LP cover for ‘Sergeant Pepper’ (1967) being the most famous. Blake exhibited at the R.A. 1954 and 1955; ‘Daily Express’ Young Artists Exhibition 1955; Five Painters, I.C.A. 1958; awarded First Prize in the Junior Section, John Moores Liverpool Exhibition 1961. His First one-man exhibition was at the Portal Gallery in 1962.Blake had a retrospective show at City Art Gallery, Bristol in 1969 and at the Tate Gallery in 1983, which later traveled to Hanover, Paris in 1984 & Tokyo in 1988. Blake became a founder member of the Brotherhood of Ruralists in 1975 with Arnold, Inshaw & Ovenden. 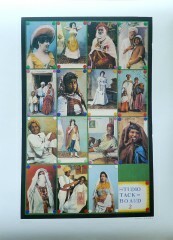 In 2000 Blake selected the exhibition ‘About Collage’ at Tate Liverpool. 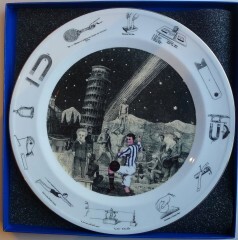 His 26 Alphabet Silkscreens were shown at the Michael Tippett Centre, Bath 2001-2002. In 2002 Blake was knighted in the Queen’s Birthday Honours and was appointed professor of drawings at the Royal Academy Schools which he later resigned in 2005 after Brendan Neiland’s expulsion. In 2003 , the London Institute displayed 40 years of commissioned work for advertising & design. His work is held in the Tate Gallery, V & A, Museum of Modern Art, New York among others.